Sustainable Living and Recreation Amazing Adventure Tours Pura Vida in Costa Rica Interested? Reserve Today! Osa Mountain Resort features and amenities include everything you need to have a fun filled vacation. Relax at the pool or enjoy any of the adventure tours and attractions offered on the property or nearby. Villas share a community swimming pool which is open daily. 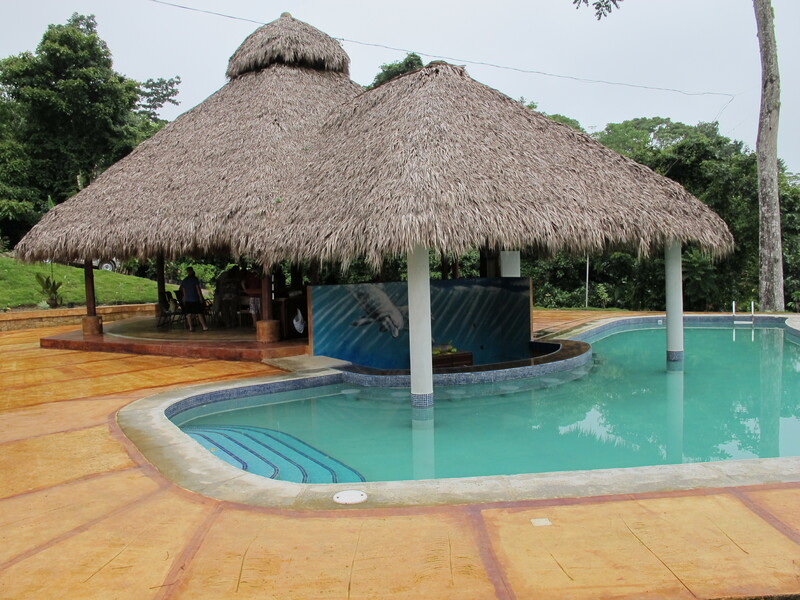 The pool is partially shaded by a thatched roof rancho (jungle style overhang). Relax with a dip in the pool or sun bathe on our recliners while sipping our refreshing tropical cocktails. The Toucan Meadows Community Center is a gathering place for residents and guests. It’s a great place to connect to free wi-fi. Meals are served daily in La Cocina overlooking the mountain slopes and jungle backdrop of Osa Mountain Resort. La Cocina serves up some great food no matter what meal of the day you choose to eat there. Toucan Tilly’s bar is located in the Toucan Meadows Rancho. At the bar you can check-in to your villa as it serves as a front-desk too. Day or night you can have fun in the game area of the rancho. All kinds of drinks are served at Toucan Tilly’s. Maybe you should try one of new umbrella drinks this time. Our resort features and amenities include washers and dryers for our guests to use if they need to wash or dry clothing. We also offer laundry service at an additional charge if you would rather have your laundry done for you while on your vacation. In either case, your clothes will be clean. Trails through the jungle are on the property and free for you to enjoy. To really see what there is in the jungle we highly recommend going out with our guide, Carlos. He will point out many things that you would otherwise walk right by. Each villa has all the amenities you will need for relaxation and entertainment including a full kitchen with everything necessary to prepare your own gourmet meals. With a choice of 1 bedroom, 2 bedroom and 3 bedroom villas to choose from guests can enjoy a comfortable stay while relaxing after a day of unique adventures!